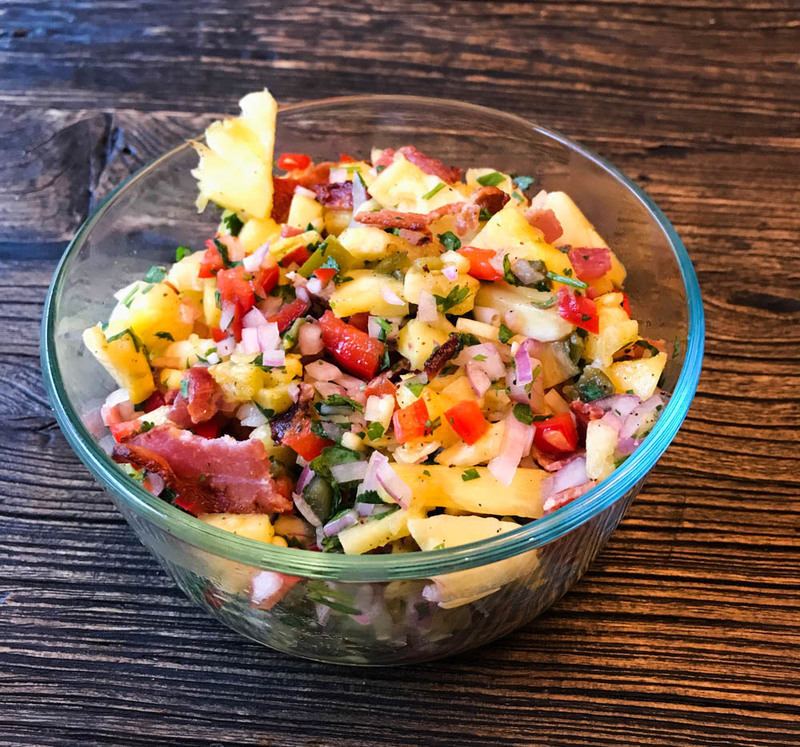 My grilled pineapple bacon salsa is a versatile dish. I love to make this when we are grilling skirt steak for tacos, or spoon it over some grilled pork chops. I have loved pineapple ever since a trip to Hawaii many years ago. A pineapple, absolutely fresh from the orchard, is an amazing thing. I have not had a pineapple as fresh or juicy since, but they’re close enough to still love them. Whenever you cook, generally you are concentrating the flavors. By grilling the pineapple, you will concentrate the sweet citrus flavors of the pineapple. Even if you do this on a gas grill, you will get a more rich flavor from the caramelization as well. 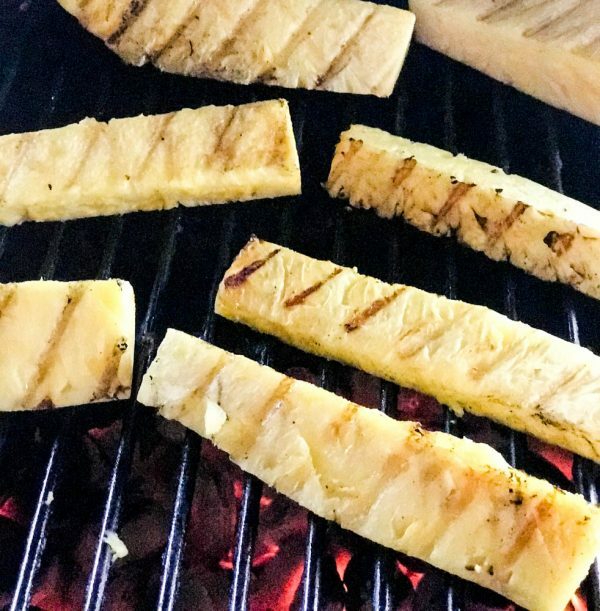 I love to grill pineapple on a charcoal or wood-fired grill, as pineapple quickly absorbs a hint of smoke and blends those flavors with it’s natural flavor. Use it on dang near everything! 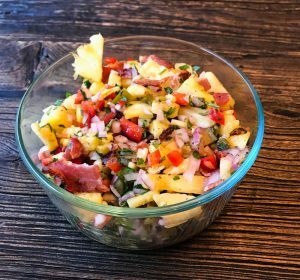 Grilled Pineapple salsa is one of those thing that just goes with about anything grilled. Want to grill fish? Perfect. Making tacos? Extra perfect. Chicken breast, pork chops, shrimp? You got it, it goes perfectly with those as well. Well, because bacon rocks! Also, the bacon in the dish adds some savory notes, and helps tie the flavors together. Add it just before serving to keep it crispy. As usual, I recommend Smithfield Bacon. It’s the baconiest! Enjoy! This grilled pineapple bacon salsa goes with almost any grilled dishes. Grilling the pineapple concentrates the flavors and brings a hint of smoke to the final dish. Cut peel from pineapple. Core, and cut into spears. Using a paper towel, pat dry the pineapple spears. Place on a hot grill and sear on all sides, about 1-2 minutes per side. Remove from grill and let cool. Assemble all other ingredients except bacon in a mixing bowl. Chop pineapple and add to bowl. Refrigerate at least 30 minutes before serving. immediately before serving, add bacon and stir into salsa. Enjoy! so simple and looks so fresh !